If you follow along with the chaos that is our life, then you may know that we recently took our first flight with the kids! We had avoided travel that included flights due to cost and to the fact that we did know how our son, who has autism, would do in an airport and on a plane. When it was time to take our first flight, we did some prep-work with the kiddo, to get him ready for the airport and the flight. Kids with sensory issues can have a hard time in crowded, loud places where they have no control. One of the ways that we got him ready was with an airport social story. What is an Airport Social Story? A Social Story can be a written or visual guide describing various social interactions, situations, behaviors, skills or concepts. We use social stories to explain, model behaviors, teach and praise individuals with autism and/or other behavioral disorders. We find that social stories can be helpful with our daily routines. I also use them as cues for things, how to get dressed or the proper way to use a bathroom. They can also be used for more adventurous things like a school field trip or even, a weekend flight to the beach! Remember, social stories are a great tool for all kids. Not just those with sensory or processing issues! With proper preparation and maybe, a great airport social story, your kids’ flights can, hopefully, be as successful as ours! 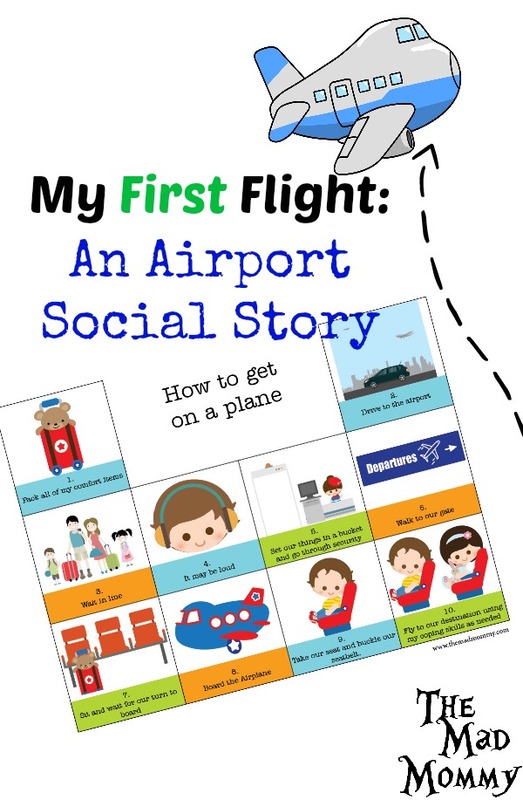 Here’s to happy kiddos and happy family travels, thanks to our airport social story! Have you used a social story with your kids? I’d love to hear about it. A social story is a GREAT idea. My youngest has special needs and that would have been a HUGE help for his first flight. It’s possible I need this for myself LOL. As I get older, I’m having trouble handling lots of noise and activity … I get overwhelmed. Awesome concept, thanks for sharing. What a cool way to teach kids! I too need pictures when learning. I wish there was such a thing when I was a kid! How cool! I’ll definitely use this with my girls! I absolutely love this idea and will share a friend of mine’s older daughter has autism. They actually were able to partake in a special on ground flight to with JetBlue to get her daughter and a few other kids with autism used to flying. Not sure if this is available all over, but know how successful this was for her girl. So thought I’d share that here, too with you. This is a very cool idea! I might try one of these with our kids to get them to develop their morning routine better! This is a great idea and I’m glad that it was such a great success for you guys! I have never heard of social stories. I am going to have to look more into it. I’m so happy that it went smoothly and he seems so pleasantly excited. Yeah! This is really great idea. I’ll use this kind of idea to my kids. This is helpful. Nice social stotry! Brilliant idea! Kids would be more engaged and adjust better in any situation. Such a great way to walk through things before they actually happen so it’s not such a stressful situation! What a great idea! Great idea! I never flown with the kids or even by myself in years. I have no idea what to expect when it comes to flying. Made me ease my fears a little. I cant imagine having to fly with your kids. I am scared flying by myself as it is. Haven’t heard of this but it sounds so cool! It’s a great idea to prepare children before boarding the plane.. I used to do this with Tommy. It helped him a lot to know exactly what would happen. This is such a neat idea. I have not heard of these concepts before, but I can see how it would work. I love the idea of social stories. I’ve never used them with my kids before, but they look like a great tool and something I’ll start doing. Congrats on making it through your first flight with the kids. I don’t have kids, but can only imagine how stressful it can be. Love the concept of a social story. I like the idea of social stories. I think that will be a great thing to remember when my son and I are flying to Boston in the next couple months. I’m glad you had a successful flight. That’s awesome that you had a good way to prep. I can imagine how stressful it is for parents to fly with their kids, not knowing how they will react. If your child has autism, I believe the worries were double. I am happy to read that the experience was a success and that it all went smoothly. Social stories are so needed in the autism community! We’ve used countless social stories in the past. This one in one you don’t see very often. I’m Pinning and sharing! What a great idea! Thanks for sharing with us at Love to Learn. Pinned. How wonderful and adventurous. I am happy you both had a successful boarding.